The manager and hotel staff give you a warm welcome and await you for your next stay. Pleasure and well-being are waiting for you at Ibis Milano Fiera. See you soon! 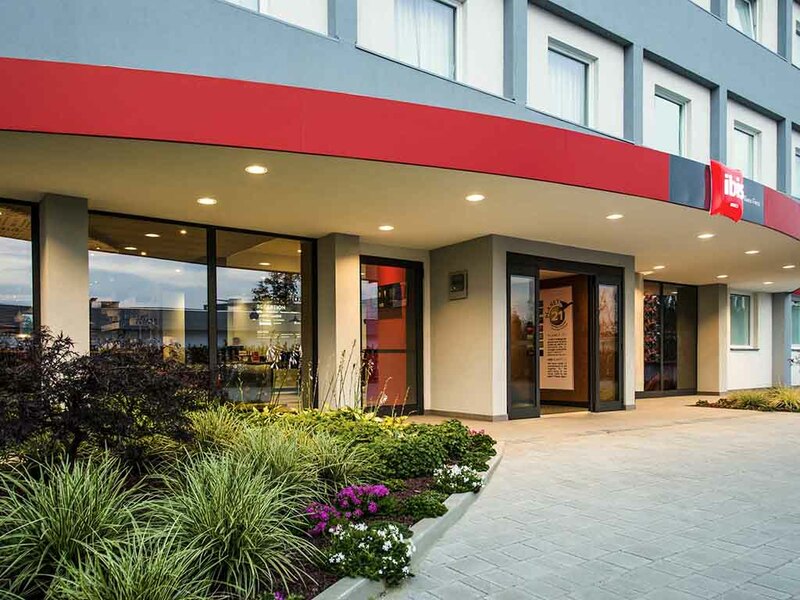 The ibis Milano Fiera hotel is a newly opened hotel situated close to Europe's largest shopping center "Il Centro" and the Fiera Milano exhibition center on the Milano-Laghi highway, a few miles from the Metro Line 1 Rho Fiera stop and the Meazza San Siro stadium. It has 120 soundproofed rooms with Internet point and free WIFI, safe, minibar, 24-hour bar, restaurant and buffet breakfast. Private parking for cars and coaches. 6.8 miles (11 km) from the new trade fair/exhibition center in Milan. Warm, modern and welcoming, with a soft bed and a functional bathroom. Complimentary WIFI, flat-screen TV and parquet floor. The room has everything you need for a pleasant stay. Mediterranean cuisine characterized by a wide range of quality dishes that will meet your every expectation. In our ibis Kitchen restaurant, you can choose from a wide variety of combinations and create the menu most suited to your tastes. The rooms are very small and there is no closet. Also, they are not properly isoleted against the noise. In the restaurant, not all the people (waiter, chief, etc) are friendly. Everything in the hotel is very nice, the rooms, the cleaning staff, the front desk personnel is very helpful. I will just comment that recently you added a chief of waitresses in the restaurant (ibis kitchen), who is a very rude person with customers and does not treat well to his subordinates, every customer in the restaurant can notice that. Am planning to staying again in this hotel, but if that person is still in the restaurant, for sure I will never eat there. Hotel very nice, well located and maintained, staff in general helpful and professional. You should just replace the new chief of waitresses of the restaurant (ibis kitchen), treats customers very rudely and also gives bad treatment to his subordinates in front of customers. I am planning to come back to this hotel, but if that person stills is in the restaurant, I will never eat there. Would be good that the staff is updated about the platinum benefits, so I don't have to ask for it. But otherwise, the stay was good, decent bed, good shower and a breakfast with a good coffee. The location is convenient provided you have a car. Hotel was outside the city and was convenient for us. Room was bigger then most of the ibis hotels. I think it was a new hotel. Staff were very kind and helpful but may be some more experience is needed. Great position, correct staff, was 3-4 times in hotel, so check-in finished for 22 sec, check-out for 2 sec, big parking, nearby Lidl and MC Donalds, internet good, clean and spacious rooms, very comfortable beds, silent rooms. Bad, without any taste, breakfast - sorry but this is thrue. Please add ice mashine nearby to vending mashines. Will came again, and recomend everybody this hotel. Visiting the Milano Fair it has been a really convenient staying. easy ride to exhibition halls. nearby shops and restaurants. nice quiet business hotel with inhouse restaurant if too tired to go out and for a good morning breakfast. The Hotel has location advantage and is very clean. Rooms are nice & clean with modern amenities. The staff was very helpful and professional. I appreciate the fact that Hotel provides 5 euro voucher to encourage guest to avoid cleaning if not required. The buffet breakfast is okay. It could be be improved to have more options and if menu can have some varieties. Daily having same offerings is boring if anyone is staying little longer. Supermarket and McDonalds is nearby which is helpful. The Hotel has location advantage and is very clean. Rooms are nice & clean with modern amenities. The staff was very helpful and professional. I appreciate the fact that Hotel provides 5 euro voucher to encourage guest to avoid cleaning if not required. The buffet breakfast is okay. It could be be improved to have more options and if menu can have some varieties. Daily having same offerings is boring if anyone is staying little longer.Supermarket and McDonalds is nearby which is helpful. Excellent . Good parking/wifi, very good staff, no problems. Staying was ok, heating didn't work properly and when i called at the reception for helping me getting a taxi from Saronno train station to arrive to the hotel, it took 4 calls from my side to the reception, 1 hour waiting outside for the taxi to arrive, drove for 10 minutes and costed me 75 euros (for 15 km). Easy to find from Malpensa and great access to Milan, the lakes and local shopping centres. Check in was polite and professional, the room was clean and spacious and the bed was comfortable. Ventilation system was too noisy and could not be regulated in the room. Breakfast selection was good but the food quality was poor and unacceptable to me - well below Ibis' standards elsewhere. Cheap & nasty breads, poorly presented and unappetising hot items, watery vile orange juice and tea which was 'scummy'. Yuk! We asked for and got a refund for two of our three prepaid breakfasts. Good rooms, secure parking . Nice evening meal good staff. Think 15 euros to check in 2 hours early is a little expensive, but not a big problem . Short walk to lainate . Good hotel .